The summer of 2016 will be the season that we celebrate Hockey Opportunity Camp's 50th Anniversary. Therefore, we thought what better time to re-vamp our website. This new website has incorporated all the same content elements that parents value when looking for a summer camp experience but it also showcases new elements that will hopefully improve the ease of use and allow us to reconnect with alumni so that we can communicate all the fun and exciting 50th Anniversary events ahead. Here's a quick snapshot of what you may experience. We feel it is important to have photos help tell our story as well as help new campers feel the emotions and experiences of life at Hockey Opportunity Camp. That is why we only use real campers in real camp situations. The smiles you see are real, the emotions you see are real and the love for HOC is real. Helping to keep in touch with our alumni has been a pivotal part of our website revamp. We hope that we incorporated the tools needed to help our alumni stay in touch, share their photos and memories, as well as help promote upcoming 50th Anniversary events to all alumni. In order to streamline the content of the website, we felt that the names of our programs also needed to be streamlined and revamped so that they are clearer for the camper and/or parent. We identify our programs first and foremost as either Overnight or Day Programs and then further by the type of program. For example, our main program at camp is Overnight Hockey + Camp Program. 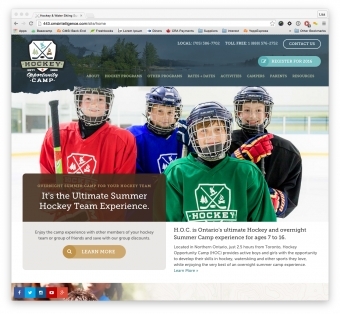 This program title shows that campers who register for this program will be staying overnight in our cabins and participating in both our hockey and general camp activity programming. We are excited for the year ahead and hope you will join us in our celebrations. See you in the summer!